Year two of taking pictures of the Monarch Butterfly’s. They are back. 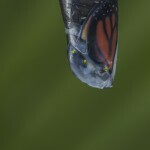 The Monarch Butterflies, the eggs, the caterpillars and now they are going into chrysalis! My experimentation of taking pictures of butterflies is fun and already hundreds of people have downloaded the butterfly being born stock photography pictures. Last year I began learning about macro close up photography. A long story short, I raised butterflies indoors learning their ways and to take close-up pictures of them. One of the unpleasant sides however, was stressing out taking care of them, they eat and poop alot. So this year I left it to the garden. I have learned enough about Monarch butterfly behavior to where I can pretty much tell when they are ready for “the change”, then I place them in a prepared bucket to do just that. Don’t catch them all, many have crawled away for parts unknown. 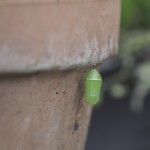 Kinda cool, there are chrysalis being built on flower pots, glued to flowers and in a bucket. I am planning shots for when they emerge, hoping the bulk of my brood will make their debut on days where I am not busy and will be able spare the time to photograph. A butterfly waits for no photographer. Luckily I have collected about 12 chrysalis to experiment on so far. Capturing the butterfly pictures takes planning and patience. It is not that easy. 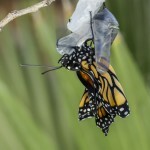 They take approx 2 weeks to emerge and then when they are ready, they are ready. You’ll notice the green Chrysalis becomes clear like wax paper allowing you to see the orange wings and black body of the baby butterfly. When it turns black, it is a sign they are going to burst. For me, trying to get good close up photography of the actual event is fun but tedious; for one thing Monarch butterflies typically debut between the hours of 8am-12pm, so you have to have everything set up in the morning and then just wait. You can’t take your eyes off it or blink for worry you will miss it. 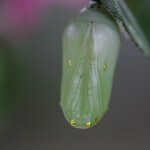 The butterfly emerging is quick and if you want to get pictures of it, it requires staring at the pupa for hours watching for the split in the cocoon. Once that happens you have about 10 seconds from split to a baby butterfly hanging for dear life on its empty cocoon. Newborn baby butterfly’s do stay around for quite a while, expelling fluid and drying their wings and makes for better photo opportunities. 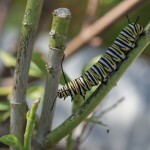 Monarch butterflies are known for hanging around for a day or two in the garden where it was born. This year in preparation, I glued the Chrysalis to flowers and things to see what versatility I can get out of my next round of butterfly pictures. Looking forward to this group, love watching them fly off and be pretty.